Swimming is high up in the minds of South Africans after the incredible Gold winning, record breaking performance of Cameron van der Burgh last night. Of course 4 men were there in Athens when we last won a gold medal in the pool or at the Olympics for that fact. We got hold of Darian Townsend before he departed for the Olympics and chatted to him about his upcoming venture to London. All Things Jabu (ATJ): Darian, thanks for the chance to chat, how is the preparation for the Olympics going? Darian Townsend (DT): The preparation has gone ok. I have been training on my own a lot because my team mates in the US had their trials in late June. So we had very different training programs around that date. But my training has been good and I’m ready to go now! ATJ: Do you feel under extra pressure to deliver due to the fact that you are part of the team that won South Africa’s last gold medal? DT: I don’t feel any extra pressure. The only pressure I feel is that I compete at my best and prove to myself that I belong at the top level of swimming. If I dive in and swim the hardest I can and don’t win, I will be disappointed but I know it was the best I could do and so I can accept not winning. Being the last team or I individual to win an Olympic gold for South Africa doesn’t put me under more stress to repeat. I think it shows us rare and Olympic gold is and that what we did in 2004 was very special. ATJ: How much time do you spend training a week? DT: I usually do a total of 9 swim practices a week, 2 gym sessions and 3 dry land workouts a week. When we are in really training I can swim up to 80 km a week. Right now we are obviously not doing that much. We are working on the finer details and making sure our bodies are feeling good in the water. ATJ: Of the other swimmers in the team, who do you think is most likely to bring home a gold for South Africa? DT: I really think our relay teams have a great shot winning at this Olympics. Cameron van den Burgh has got an excellent chance of winning the 100 breast (ATJ – Well called!). Chad Le Clos is swimming quite a few events; he is looking to grab a medal or two. 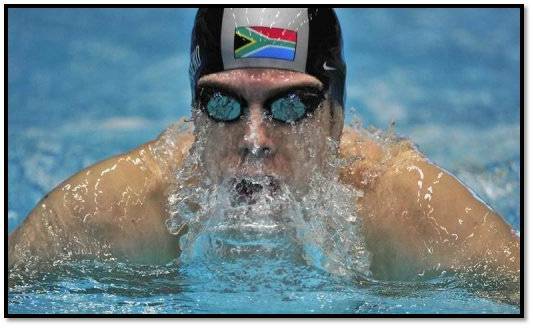 We also have Roland Schoeman who is swimming very well again. Look for him in the 50 free. ATJ: This is your third Olympic games, after the disappointment at the 2008 Olympics, what is your goal for these games personally? DT: I will be swimming on our relays at the Olympics as well as the 200 IM. I am looking to make the final in the 200 IM first. I have kept missing out on that over the last 4 years. So that is my main goal right now. Once I get into that final then the race is on for a medal. ATJ: In 2010 you broke a World Record that was subsequently broken by Ryan Lochte, have you got it set in your sights again? DT: I broke Ryan’s 200 IM short course world and he broke it back at the end of 2010. After this Olympics the short course swimming season starts again and will shift my focus to trying to regain it. I believe I am a better short course swimmer especially in that event, so I will definitely have another go at breaking it back. 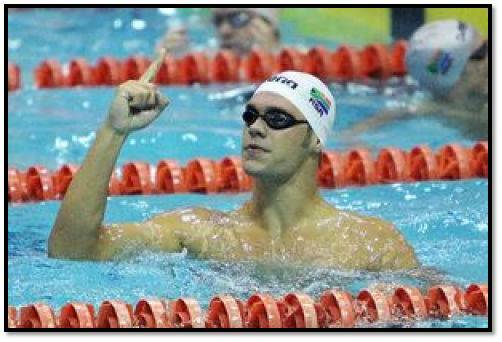 ATJ: You are 28 now, do you hope to represent South Africa again at the 2016 Olympics? DT: If I am still swimming in 2016 then I will attend our Olympic trials and try make my 4th Olympics. But that is a long way away. Will take it one year at a time. ATJ: Apart from the gold in Athens, what has been the highlight of your career? DT: Breaking the short course 200 IM world record is definitely one of my best achievements. I also really enjoyed my college swimming that I did for the University of Arizona in the US. Winning a National title with them in 2008 was a lot of fun and very rewarding. ATJ: You study and train in America. Is the quality of training better for you there? DT: I believe the training there is better for me. I train with other Olympians and world record holders every day and we push each other to become better. I believe this is the reason the US has been so good for me as a swimmer. The facilities are slightly better than what SA has to offer, but it’s the quality and quantity of good swimmers that makes the US such a good place to train in. ATJ: Will you be coming back to South Africa in the future? DT: When I get done competing I will start coaching. I have not decided where I want to coach. With the US being so big the job opportunities are more over there. But I do miss SA a lot and could see myself moving back there. Time will tell I guess. 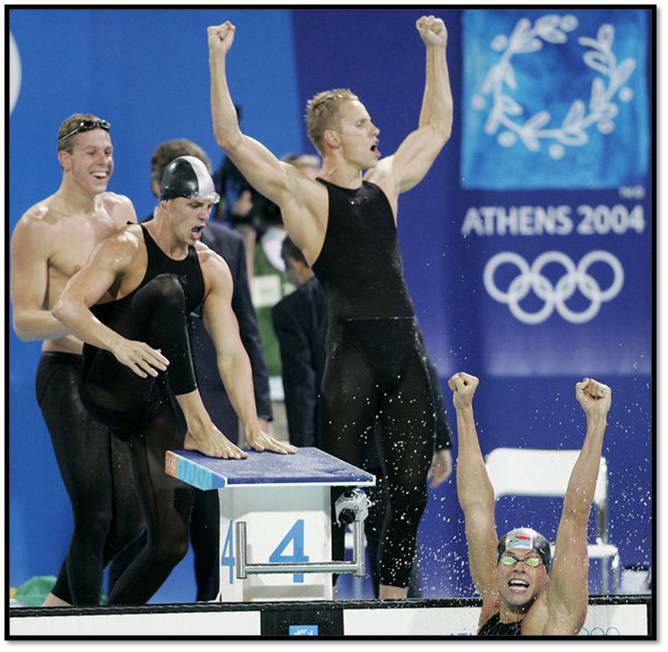 ATJ: Who is the best swimmer you have ever competed against? DT: I would have to say Ryan Lochte. I trained with Ryan for two years at the university of Florida. He trains really hard. No matter how he feels in training, good or bad he knows how to win. He is also very talented in all the strokes and distances. He is a very hard person to beat. ATJ: What other sport are you a fan of? DT: I am a huge football fan. Manchester United is my team. I’m planning to go see their stadium once I am finished swimming in London. It has been a lifelong dream of mine to go and visit it. Really looking forward to seeing it! ATJ: Thanks so much for chatting to us Darian! Best of luck and know that the country is backing you!